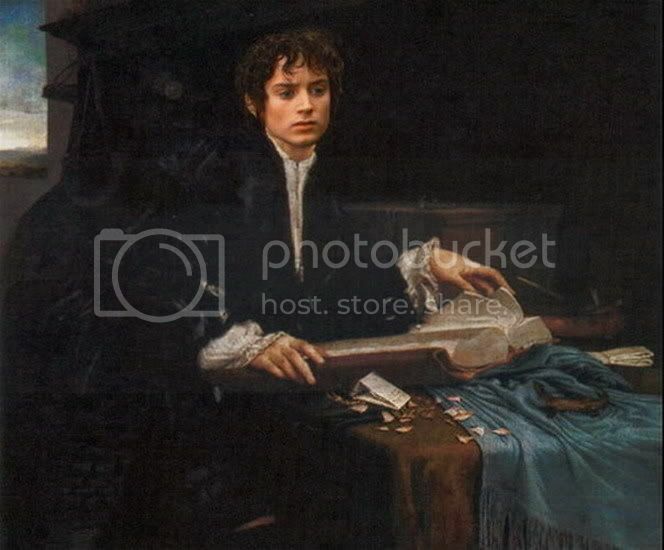 ~ detail from "Frodo in His Study"
Recently, looking for a different work, I found a much better copy of the painting I used for my first version of this manip, Portrait of a Young Gentleman Reading (or, "Portrait of a Gentleman in his Study"), by Lorenzo Lotto. Goaded by its clarity, I made my own screencap of the image from FotR (Amon Hen) I had found on an internet gallery and used for the face last year, and re-did the manip. I credit this to a fan of the manips who liked the first version of this particular Frodo Art Travesty so well, I wondered if I could improve upon it. The version I first did, which she saw, never fully pleased me because it was so small and murky, although it had its own charm. (It can be seen here.) I did not take it down from the Photobucket gallery, however, because it really does look like a different manip. 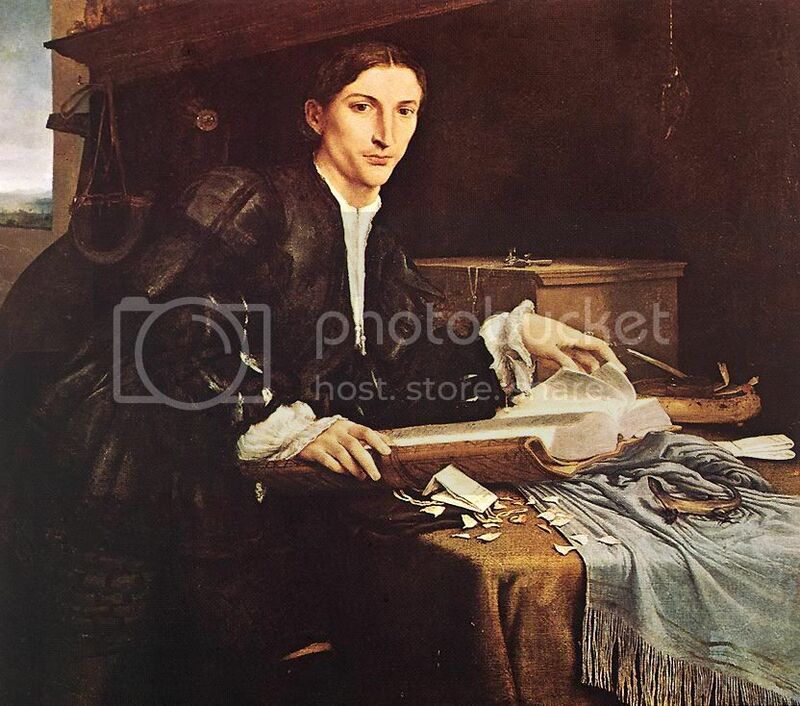 The copy of the painting I made it from is so different (in colour values and in resolution), it makes the finished manip different, and I sort of like them both. Frodo Art Travesties Table of LJ Entries page HERE. Frodo Art Travesties Album HERE. A brilliant combination - Again, you have done yourself proud! However.... I am not entirely pleased with the throat... Would you mind if I offered a suggestion? Beautiful artwork Mechtild! I love both versions too, as you said they are different enough to look like two different pictures and I really love them both! Great work! Me, too. They made Frodo seem to have a slight shoulder twinge in the film, rather than anything like his full-blown anniversary illness. This was another thing that made book virgins wonder why the heck he felt he had to sail off into the West. Couldn't he have taken a couple of Ibuprofen? Cool to see Ariel's suggestions, also. Oh Mechtild ~ that is so beautiful. I can get some idea from the discussion between you & Ariel just how much work & concentration it takes to produce something like this and the result is just breathtaking. Also, I do agree with you & Mews about that scene in the film - I'm certain that anyone who hadn't read the books would be at a loss to understand exactly why Frodo was leaving. Alas, I think it only contributes more of the sense that film-Frodo is an awfully fragile, sensitive little thing, blown about by every wind and prey to every emotional crisis. Again, it's not like I don't love film-Frodo, I do. But, remember, whenever I watch the films, the whole while my mind is "filling in" material about Frodo from the book, while I watch. 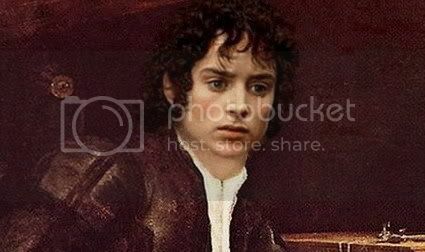 I never see film-Frodo any other way. Even if the film skipped over the Barrow scene, or Frodo talking ably and wisely (like a fellow prince) with the Lord Faramir, or if it failed to show the extent of his nobility and the depth of his mercy in the scene with Saruman in the Scouring, I am thinking all those things as I watch -- as if all that actually was filmed but is somewhere on the cutting room floor, LOL. Gosh! He wears that kind of thing so well!!! These are wonderful, not a travesty among them. I'd say you've created new masterpieces. "Masterpieces"? Well, I've been given a leg up by the Masters. Thank you very much, Ink Gypsy!